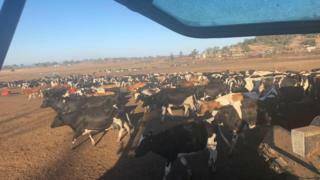 Farmers across eastern Australia are enduring what some have called the worst drought in living memory. On Wednesday, the entire state of New South Wales (NSW) was declared to be drought-affected. It is the same situation in more than half of neighbouring Queensland. Many farmers say they are struggling just to keep going, with little rain forecast for the coming months. “Farmers are getting out left, right and centre. 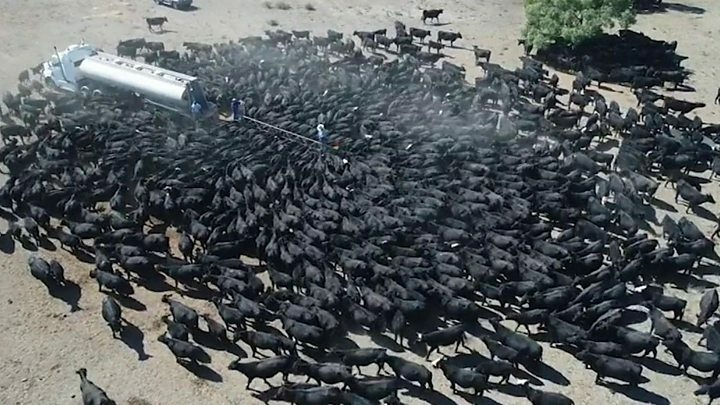 It’s gotten to the point where it’s cheaper to shoot your cows than it is to feed them,” NSW dairy farmer Jason Maloney told the BBC. Farmer Ashley Gamble says his family has been part of Queensland’s dairy industry for more than 150 years. He fears that five-generation legacy will end with this drought. Mr Gamble says his 850 cows typically produce at least five million litres of milk each year. Due to the drought, production has halved. His farm is running at a loss, and he can no longer afford to feed the cows. Sourcing hay is a challenge, and paying for it is even harder. Mr Gamble says a single truckload costs A$4000 (£2,300; $3,000), and supplies last less than a day. “I don’t know where we’re supposed to get the feed from to keep going,” he says. “We’re living day by day and this drought could go on for another six, 12 months. Lynette Rideout-Kenneally owns an orchard just outside of Sydney, in NSW. Amid the drought, the two dams her property relies on have nearly dried up. Ms Rideout-Kenneally says she has some water in reserve, in case bushfires break out in summer. “We’re relying on donations of water every few weeks and it’s scarcely enough to keep things going,” she tells the BBC. She says that most of her apple and peach trees will not yield any fruit fit for sale this year. About three quarters of the trees she planted last spring have died. Ms Rideout-Kenneally says the conditions are the worst she has experienced. Jade Whatman, 22, says she sees the strain of the drought in her parents’ faces. Like other dairy farmers, they are struggling to make ends meet. Their last purchase of hay cost A$19,000 – a load they hope to stretch out over a week. “Mum was so stressed – she broke down and was crying before,” Ms Whatman says. The family recently set up an online fundraising page, which has raised more than A$40,000. “People are caring, and we have gotten support from the community and that has helped us stay positive,” she said.